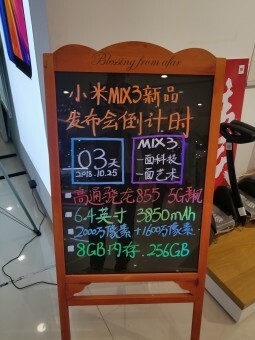 Xiaomi has officially confirmed that the Mi Mix 3 will support 5G connectivity, but the company may be withholding something even more interesting about the hardware – a next-generation Snapdragon chipset. It’s referenced as the “855”, though a rumored change in Qualcomm’s naming scheme would see it launch as the 8150 instead. But that’s besides the point – this board gives away juicy details like a 6.4” screen, a 20+16MP dual camera, 256GB storage and a 3,850mAh battery. The RAM capacity is listed as 8GB even though Xiaomi teased 10GB, which is likely the base and maximum capacity, respectively. The chipset info (if true) is a big deal as the previous assumption was that the Mi Mix 3 will use the tried and true Snapdragon 845. Qualcomm’s first 5G modems are external, that is they do only 5G and leave the older networks to the modem built into the chipset. So, 5G connectivity was no guarantee of a chipset upgrade. Plus, the Snapdragon 855/8150 hasn’t been officially announced yet. The screen size is curious too, it matches the diagonal of the original Mi Mix (the 2 and 2S went down to 5.99”). The aspect ratio will be taller – 19.5:9 – but resolution is expected to remain essentially the same at 1080p+. The dual camera on the back will be upgraded for sure, though, Xiaomi has confirmed 960fps slow-mo video shooting.